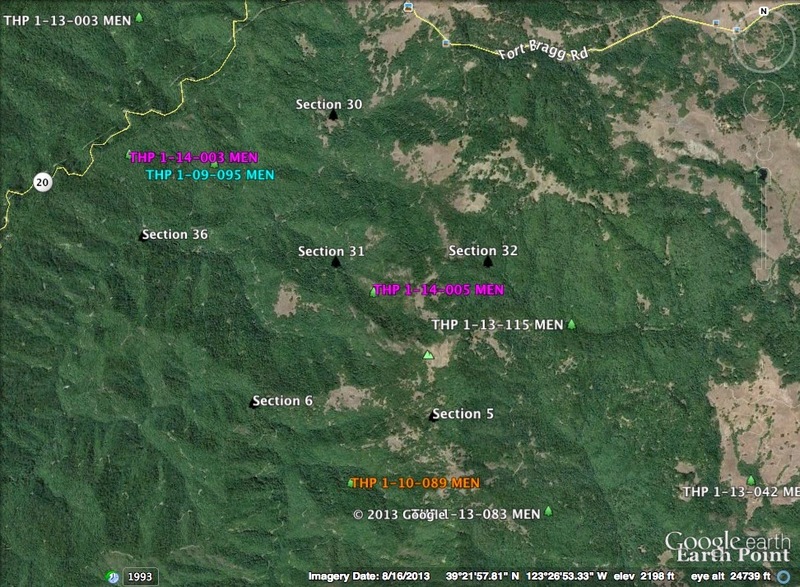 This THP is about 6 miles SW of Willits, CA and a few miles south of Highway 20 near the North Fork of the Big River which is listed as impaired for sediment and temperature. Coastal Ridges LLC is planning a tractor and cable logging operation on steep and unstable slopes in redwood and Douglas fir forests at an elevation of 760 to 1,960 feet. The THP area has numerous landslide terrain features including rockslides and debris slides; multiple misc road failure sites including road bed slumping, fill failures, overtopped culverts, shot gunned culverts, and landslide deposits on road beds. Coastal Ridges LLC wants to use ground based equipment in areas designated for cable logging, use skid roads and landings inside class I and class II watercourses, and use ground based equipment on steep slopes over 65%, and on slopes over 50% grade with a high erosion hazard. There are 61 road drainage sites planned for work including rocking, dip construction, and culvert repair and replacement. Overall, this THP will impact the Northern Spotted Owl by removing 7 acres of nesting/roosting habitat, and 211 acres of foraging habitat. For spotted owl site MEN0225; nesting/roosting habitat will be reduced by 7 acres; and foraging habitat will be reduced by 28 acres. For spotted owl site MEN0303; no nesting/roosting habitat will be removed within .7 mi because the area is deficient, and 137 acres of foraging habitat will be removed within .7 mi. There are peregrine falcon sites within .5 mi of the THP area at "Two Rock”. This THP is adjacent to Coastal Ridges LLC’s Seven Mile Redux THP 1-14-003 MEN (see THP Blog post Coastal Ridges LLC to log on steep and unstable slopes near Willits, CA.). More information is available on the THP Tracking Center website.